Tottenham say their new stadium will not be ready to host matches until at least March. Spurs were originally scheduled to move into the new White Hart Lane stadium in September but the project has suffered construction delays. The club took their latest decision after an update from contractors. "I should like to apologise to our fans and thank you for your continued patience," said Tottenham chairman Daniel Levy. 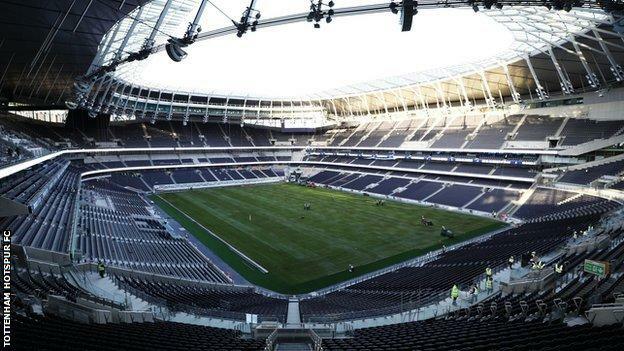 The new ground, which will also host NFL games, has a capacity of 62,062 and is located on the site of their old White Hart Lane home. In December, several thousand season ticket-holders were allowed to explore the South Stand during a fan familiarisation event. "The response from those who attended the familiarisation event was great to hear and reinforced our commitment to deliver an exceptional matchday experience for everyone," added Levy. "We shall now seek clarity in respect of building test schedules and test event dates and provide further information on these in the next two to three weeks." So when could Spurs move in? Tottenham, who host Manchester United at Wembley on Sunday in the Premier League, said in a statement that top-flight matches against Watford, Newcastle and Leicester would also be held at the national stadium. Additionally, the home leg of their last-16 Champions League tie with Borussia Dortmund and any FA Cup fifth-round fixture, if they reach that stage, will also take place at Wembley. Their next home game after that would be a Premier League game against north London rivals Arsenal on 2 March, but it is considered highly unlikely police or safety advisory groups would want that to be the first game at a new ground. That would mean the game against Crystal Palace on 16 March could be Tottenham's first at their new home. If Tottenham beat Dortmund to reach the last eight of the Champions League, the home leg of that tie would also take place in April. "Uefa will remain in close contact with Tottenham Hotspur to assess the possibility of the club hosting Uefa competition matches in their new stadium this season," said European football's governing body. Meanwhile, Brent Council will decide on 16 January on the request to increase the capacity from 51,000 to 62,000 for Spurs' matches at Wembley.